The in vitro environmental conditions (temperature, pH, buffering capacity, osmotic pressure, dry matter content and oxidation-reduction potential) should represent as closely as possible those of the rumen. Irrespective of the technique applied, the quality of the inoculum is one of the most important aspects in rumen simulations. In most studies the rumen fluid is strained through two, sometimes even four layers of cheesecloth. As a result, the inoculum is likely to represent only the microbes occurring in free liquid and a major part of the cellulolytic micro-organisms is lost. Efforts that can more effectively reproduce the real conditions within the rumen will be very useful. 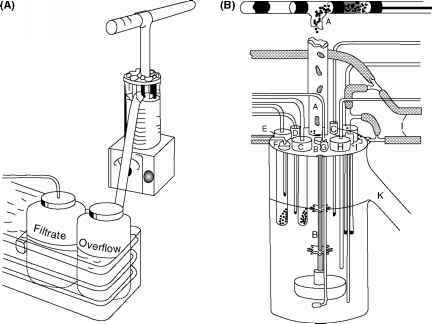 Nevertheless the designs may be too complicated for routine and easy use: particle block up in the outlet filter or daily opening of the fermentor for feeding the microbes prevents the usability. A continuous culture system of two (52) to 21 (53) reaction vessels with running times of three to four weeks is not a very rapid method for analyzing the effects of feed substances on fermentation patterns of rumen microbes. The advantage of a batch simulation over continuous one is not only the possibility to have more replicates but also the flexibility to test a greater number of different treatments simultaneously. The lack of substrates or excess of accumulated end products are, more rarely, the reasons for microbial changes in continuous culture systems. Those fermentors, which have a uniform and fast turnover rate for the total contents, quickly lose part or all of the protozoa. Stabilization of the system for several days will lead to selection and survival of those microbes best adapted to that environment. Irrespective of the artificial rumen technique, the longer the simulation is run, the greater the difference that will develop in the microbial populations compared to the original inoculum. However, a stable fermentation that can be maintained long enough to allow microbial adaptation, is considered desirable by continuous culture users (36,55). The use of actual feed components and compositions presumably assists the maintenance of a representative population also in continuous culture systems. Although some of the artificial rumen techniques are more superior in taking into account the microbial compartments or the different transfer rates of liquids and solids, none of them include the activity of bacteria associated with the rumen wall or the interaction with the host immune system. It is both challenging and difficult to mimic ruminal fermentation and measure the parameters as they actually happen in the rumen. The real long-term effects of a test substance on rumen microbes and animal physiology can be evaluated neither with a short batch simulation nor with continuous culture simulation run for several weeks. Nevertheless, simulation of the rumen in vitro is a valuable technique for evaluating particular feed components and testing new diets before undertaking animal experiments.